There are a lot of different marketing automation platforms available in 2016. So many that’s it’s easy to become overwhelmed and confused about which one’s right for your business. This post should help! I gathered experts on each of the email automation softwares discussed below so you get a thorough look into each of them. Other posts or reports on the best marketing automation software are typically written from the perspective of a consultant for one of the softwares. This means the post is completely one-sided, in favor of that consultant’s software preference and skims over the other softwares. It’ll take you awhile to read through it but it’ll be worth it! Marketing automation software can transform your business if setup properly. You can make more money, make your current clients happier and get a lot more organized. One more helpful note, setting up marketing automation software can be difficult but with the right consultant you can transform your business. I’ve included recommended contacts for each of the marketing softwares below so you can get up and running within a few weeks. 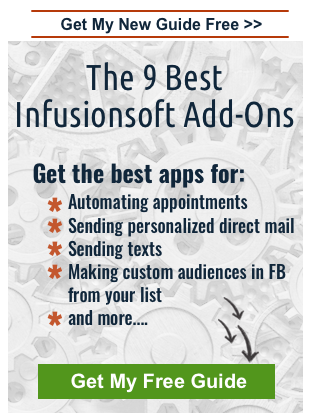 Infusionsoft is a marketing automation software. It can automate a lot of your sales funnel, as well as other admin tasks like appointment scheduling, billing, referrals, surveys and invoicing, as well as offline marketing like direct mail and text messaging. Infusionsoft gives automation to small businesses at an accessible price point. 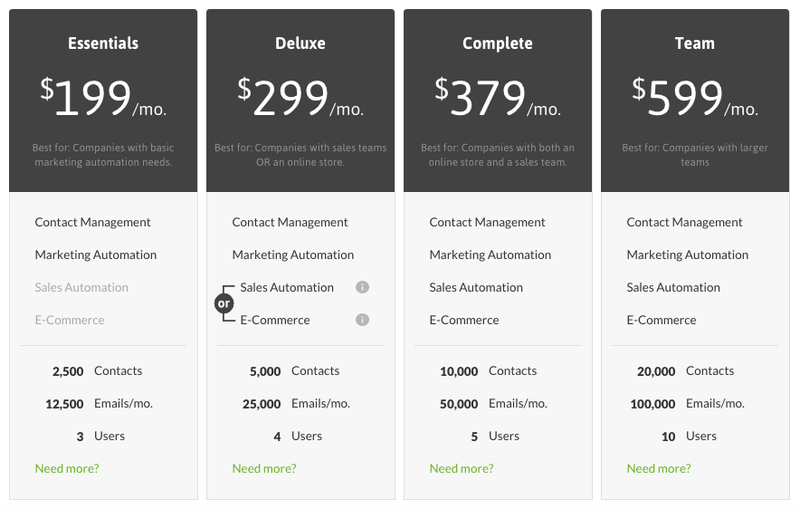 Unlike some of the other options, Infusionsoft offers a great package for only $199/month. Another great benefit to Infusionsoft is the clear visual layout of processes. It looks like a mind map, so when you build of your funnels and processes, you can see the step-by-step flow easily. Lastly, Infusionsoft has a huge marketplace of add-ons and consultants. If there’s a feature that you feel is missing in Infusionsoft, you can likely find an app or customization to do that pretty easily. The biggest disadvantage to Infusionsoft is the steep learning curve. This is the #1 complaint. When you get it setup it’s an amazing tool but a lot of people are too overwhelmed at the beginning and get stuck. The simplest solution for this is to hire a consultant for a few weeks to help walk you through it and get it fully setup and running. There’s also no free trial with Infusionsoft, your only option is to pay the kickstart fee of $1495. Click here to instantly book a free 15 min demo and strategy session with Justin Jacques, an Infusionsoft Certified Partner, to see if Infusionsoft is right for you before making the leap. 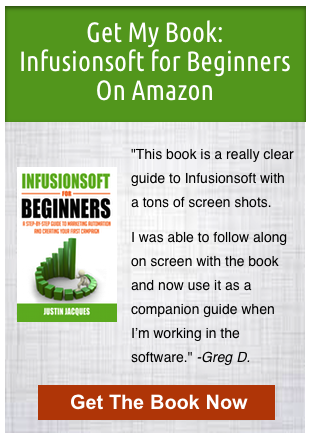 Infusionsoft is really ideal for small businesses of less than 20 people. More than that and it may no longer be cost effective compared to enterprise solutions, which are designed specifically to work for large businesses. It’s also an amazing tool for online businesses that do a lot of selling online. It will replace a lot of the tools that you’re using to sell online and put them all into one software, making it easier to see and track your full sales funnel. It can do some offline marketing/tracking but it wasn’t designed primarily for that. Because Infusionsoft automates a lot of sales and admin tasks, it’s great for anyone ready to hire a VA. It has 100% consistency and reliability and is priced better than a good VA.
Who is Infusionsoft Not For? As mentioned in the previous answer, its not a great solution for large businesses with more than 20 people or a sales team larger than 6. It’s also not for very new businesses, likely the price point is too high and it’s too complicated for what you need. When you don’t have very many leads, you can handle most of the sales process manually or with simple tools like Mailchimp. Businesses with minimal online presence will also not get their money’s worth from Infusionsoft. The main benefit is online automation, specifically with the sales funnel. If you don’t do any online selling or lead capture, I would not advise Infusionsoft. Lastly, it cannot give very specific granular metrics, like open rate at a specific time/day. If you want to learn if Infusionsoft is right for your business, click here to instantly book a free 15 min demo and strategy session with Justin Jacques, an Infusionsoft Certified Partner. He can quickly help help you decide if it’s best for you businesses size and industry. You can also email or call him at justin@justinjacques.com or 416-819-0924. Mailchimp is an email marketing software with very basic automation and no CRM. The automation is strictly time-based, meaning you can schedule emails based on timing, like when a contact joined the list or day of the week. You can’t send emails based on actions like Infusionsoft, where you can automatically send an email if they clicked a link or watched a video. Mailchimp is a great starter tool, it’s inexpensive or free and very easy to use. No consulting required to get this tool setup. It also does not require a double-opt in, unlike some of it’s direct competitors like iContact. You can easily import a list without requiring them to opt-in again. Unlike some of the big guys (Pardot, Infusionsoft, Hubspot), there is no CRM in Mailchimp, along with some of the other big features (shopping cart, affiliate programs). 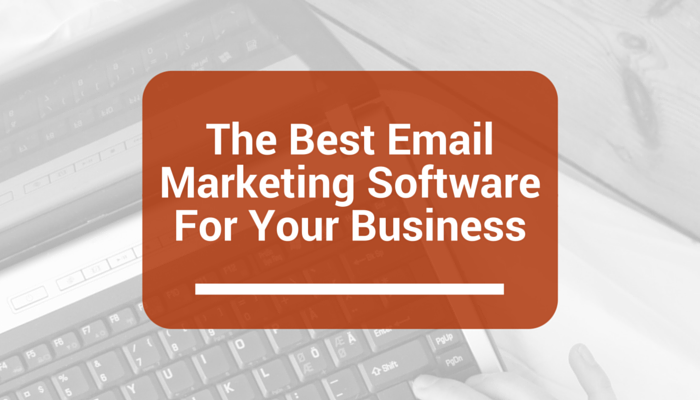 To do anything besides email marketing you will need separate softwares. It’s just one small piece of the puzzle and it can become chaotic after a while having so many disconnected moving parts. There’s also no action-based automation, meaning you can’t send follow-up emails based on certain actions that an email subscriber takes. This is a really cool feature of tools like Infusionsoft because it can increase conversions by segmenting your list based on how engaged they are in your content. Lastly, this solution is only cost effective if you are sending a low volume of emails. It can become pretty expensive ($2000+) if you have over 500,000 subscribers. Again, it’s great for the new marketer but eventually one of the other tools on this list becomes a much better option. Who is Mailchimp Best For? If you’re ready to start incorporating a bit of automation then Mailchimp can do just that. Mailchimp is great if you don’t have a lot of leads and have the time to manually walk them through your sales funnel. Mailchimp is also great if you’re doing more email blasts to a subscriber list, rather than repeatable sales emails. If you have a newsletter business where the content is created weekly than Mailchimp can easily do this for you. Essentially it’s a great tool if you’re at the point where you have more time than money. Once these variables are reversed, look at one of the more automated solutions. Who is Mailchimp Not For? You might want to look at the alternatives on this list if you feel like you’re starting to drop the ball with leads. If your business is growing and you’re stressed about consistently following up with leads and you need more automation with a CRM to track your current customers and prospects, then Mailchimp is NOT for you. You should also look to the alternatives on this list if you need more lead tracking or have enough traffic volume and customers to properly evaluate conversion and email data. By this I mean, you have more than 10 people getting your emails because obviously the results of that data won’t be statistically significant. Salesforce has been named a Challenger in the Gartner Magic Quadrant for CRM Lead Management, due to Pardot’s marketing automation functionality, ease of use and strong integration with Salesforce. Integration with data vendors, social media tools and webinar platforms. At the moment Pardot is still sold as a separate solution from the Salesforce CRM, however it augments Salesforces’ capabilities. This makes it very easy for companies to deal only with one vendor for all the sales and marketing needs of an organization. The Salesforce Engage functionality, launched in April 2015, provides the ability for sales reps to send marketing campaigns from mobile devices based on templates. This is very useful for travelling sales reps who use extensively mobile devices and the Salesforce1 application. Many of the clients would like to see stronger integration with the Salesforce Campaign Object, which will allow more marketing management and reporting directly in Salesforce CRM. Pardot is still a separate database than the Salesforce CRM. The two systems need to be synched so both sales & marketing can use the same data nexus. We hope to see a tighter integration with Salesforce now that more Salesforce resources are allocated towards Pardot. In addition, companies also work with specialized Pardot Consulting organizations to help them with implementations, training and managed services in order to make the most out of what it has to offer. Who is Salesforce+Pardot Best For? Salesforce Pardot works best for small and medium size organizations currently using Salesforce CRM who are thinking of extending their CRM functionality to include marketing. Salesforce Pardot was adapted quickly by the B2B technology vertical but is growing quickly in other verticals like travel and retail. Who is Salesforce+Pardot Not For? Organizations which do not use Salesforce CRM will require additional resources to use Pardot within their demand generation infrastructure. It is recommended for people already using Salesforce in their business. ONTRAPORT is an all-in-one, business-building platform that helps businesses and entrepreneurs run and grow their business. It handles everything small businesses need to conduct business online, easily. A great new feature of ONTRAPORT is the ability to create custom objects, where you can link custom record types to a related sub-contact record. For instance, a veterinarian office might have a dog owner as the main contact. With custom objects, they could list pet names and relate them to the owner’s contact record. You can link records for companies, bids or quotes, sales opportunities, courses and students, trips, or any other data. Every custom object has its own API and you can even automate follow-up around these custom records using ONTRAPORTs powerful automation. As with any CRM system, you expect the ability to see a historical record of a contact. ONTRAPORT has a visual color-coded system that allows you to see in a glance, exactly what interactions that contact has done, whether opening an email, completing a smart form, or being added to a fulfillment list. Rules and global rules are one of the key automation drivers of ONTRAPORT. Users have the ability to create powerful if/then rules within an automation sequences. Additionally, global rules can be created, that are applicable when certain criteria are met and are not tied to a contact being within a sequence. Each rule has an if/ then trigger component and can be stacked together to create complex automations. One of the biggest roadblocks to overcome is the web form builder. So many of clients want a horizontal opt-in bar that runs above or below a hero image on their websites. These currently have to be custom coded with CSS, which can be tricky if you have a mobile responsive website or don’t know CSS. Not impossible, just a bit of a hassle. You do not have the ability to change a tag name, you must create a new one, add the new one to anyone who had the old tag, and delete the old tag. This can be cumbersome. ONTRAPORT has a metrics dashboard that can be customized, but it doesn’t drill-down where you can look deep into the data. The reporting feature could be more robust. You can create sales forms if you want to sell 1 product per purchase through ONTRAPORT. Other than using an upsell form, if you want a customer to have the ability to add other separate items to a cart and pay for it in one transaction, then you must integrate with a shopping cart. Currently ONTRAPORT integrates with UltraCart, WooCommerce, Samcart, ClickBank, and 1ShoppingCart. Most cases with these integrations, the purchase history is pushed into a contact record in ONTRAPORT; however it depends on the API. The CRM portion of ONTRAPORT is geared more toward a business owner user rather than a sales team, like for instance, InfusionSoft’s CRM. It can be set up to have a more sales force friendly workflow, but does not come that way out of the box. The affiliate area (also called Partner Program) that is auto-generated with PilotPress (the proprietary WordPress plugin for membership websites) needs a major facelift in my opinion. ONTRAPORT has been working very hard on the template area for landing pages and I’m hoping they will turn that attention to the auto-generated pages for PilotPress soon. Frankly, I think InfusionSoft has a much better looking and easier to understand affiliate area for logged in affiliates. 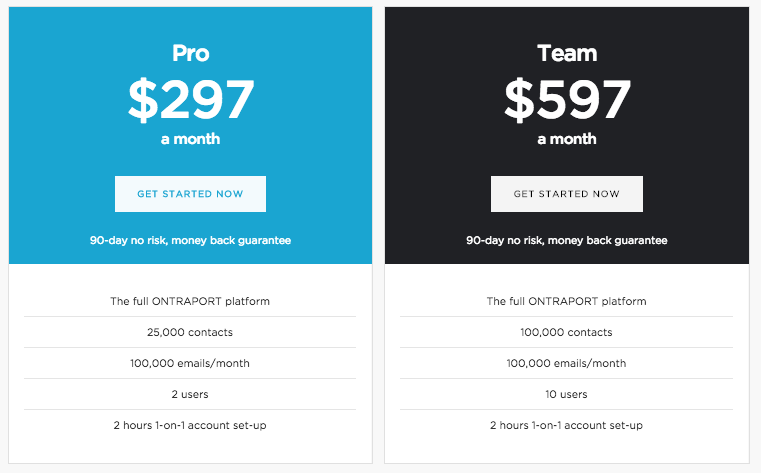 Unlike some marketing automation systems, ONTRAPORT is not a module-based where you have to purchase more add-ons to get new features; everything is included in the monthly price. There is no required setup fee. There’s also a 90-day no-risk money back guarantee. Who is Ontraport Best For? If you want to add online courses through membership sites to your business offering, ONTRAPORT is an excellent solution. You don’t have to have a huge list of contacts to get started with ONTRAPORT. Generally when you reach that top end of the email marketing systems like Aweber or MailChimp (1500-2500 email contacts) and you’re ready to move to the next level of marketing automation, then you may great fit for ONTRAPORT. Who is Ontraport Not For? ONTRAPORT is not a best fit for strictly retail product-based business at this time. Enterprise businesses will want a larger-scale solution. If you want to be sure ONTRAPORT is the right move for you, contact Julia McPherson (Julia@innerspacemarketing.com or (469) 219-9608) for a free 15-minute demonstration and no-obligation discussion around your business growth. Once setup, if you feel overwhelmed, you may want to consider hiring a Certified Consultant, such as Julia, to help you map out a campaign flow and get more complex systems in place. She currently offers 5 free consulting hours, a $500 value, for anyone purchasing ONTRAPORT with her affiliate link. Those 5 hours could be one-on-one training, troubleshooting or used to set up a few more complex sequences in your new system. You can learn more about her and her ONTRAPORT services at http://innerspacemarketing.com/. AWeber is one of many products called “Autoresponders.” Their original purpose was to send a sequence of emails to people. That sounds easy, but as soon as you have hundreds of people starting the sequence on different days it becomes a nightmare. What Autoresponders are expected to do has grown over the years until today the “send emails” portion is only one piece of a large set of functions. Feature #1 – Collecting email addresses. The input side of AWeber is where a lead’s email address (and optionally other information) are collected and entered into a database that is called a list. You can have as many lists as you want where the subscribers in each list have something is common e.g. they asked for a certain free eBook or they bought a certain product. Obtaining a person’s email can be as simple as having them email @Aweber.com. It can also be as complex as creating a very pretty form and inserting directly into Facebook. Feature #3 – Sending one-time emails to selected groups of subscribers. AWeber does this with Broadcast eMails and you can schedule these as far in advance as you care to go. Feature #4 – Reports. There are numerous reports available to help you deliver you newsletters or marketing material better. AWeber is one of the most popular and reliable Autoresponders on the market today. These ease of use and support rival anyone in the industry. Aweber is also one of the most tolerant systems you can find. Many Autoresponder companies do not like MLMers, Internet Marketers and the list goes on and on. AWeber is zero tolerance if you are spamming, but they are not overly restrictive about what you can send emails about. While there are many other advantages, one big one is integration with other software packages. Aweber integrates with a very large list of softwares (e.g. Facebook and PayPal), not all but more than most autoresponders. There are a couple of things that could be improved. Integrating better with WordPress – AWeber’s HTML code to insert into your website makes it very difficult to avoid having empty lines between the fields you ask your leads to fill out. Since you really want to keep important things on your webpage “above of fold” (available without scrolling down), these extra blank lines are annoying. It would also be nice to have the ability to move a subscriber from one list to another when they take a specific action (like click on a link in your email). Features like this are available using third party enhancements, but it would be nice to have it built in. AWeber is best for small to medium sized companies. It even works well for large companies who do not run completely on internet based applications. Who is Aweber Not For? If you are a small club with no resources and no plans to grow, there are some free services that will probably meet your needs. On the flip side, if your company is developing into an online giant with hundreds of products and are into upsells, downsells, One-Time-Offers and the like, there are some companies that handle complex systems and campaigns better. Contact Hale Pringle (halepringle@gmail.com) or visit his website http://HalePringle.com. Marketo is a marketing automation platform for businesses to manage and engage leads over time. The goal is to automate the process of engagement so that a manageable portion of leads can be given to sales reps for closing. Lead management: routing, processing, and sorting leads. Lead Scoring: ranking leads based on behaviors and demographics. Easy to use Landing Page and Form builders and collectors. Email and Landing Page AB Testing Tools. Sync leads between Marketo and CRM. Notify Sales of potentially hot leads. Engage leads at the right time with the right message with Nurturing and Dynamic Content. In other words, Marketo is a complete B2B marketing platform. Marketo is best used as a marketing automation platform to manage and engage with thousands of leads over time. Marketo provides excellent tools in this regard as well as connections to many other tools, including CRMs. It integrates well with any website platform or CMS. As with any marketing automation platform, Marketo requires a certain amount of setup by experienced marketers or marketing technologists. A lack of training and preparation to use Marketo, especially in smaller firms is a chief cause of dissatisfaction with Marketo. The ability to look at list/lead and client analytics is possible, however, not easy to get. This is largely true for the other platforms as well. Marketo pricing is based on the number of Email Addresses (Leads) in the database and the level of features you subscribe to. Each level offers additional tools to manage or target leads better. Payments are quarterly or annually and based on monthly pricing. There are no per email fees. Who is Marketo Best For? Marketo’s pricing options mean that it is a great service for organizations from SMB to Enterprise. I recommend Marketo usually when a firm has 20,000-30,000 leads and wants to push leads to sales reps automatically. High growth technology firms or media firms with an expectation of a large lead influx should also use Marketo’s advanced lead management capabilities. Who is Marketo Not For? Very small firms with one marketer or under 20,000 leads will find Marketo to be too powerful. To use the system effectively requires training, implementation, and content. Very small businesses should consider the resources required to make any marketing automation software useful to grow the business. Marketo may require more resources up front and distract from the growth plan for a business of this size. Marketo can be used by any firm in any industry, including Universities and non-profits. The keys to success are a steady stream of great content and a dedication to using the tool. Many firms choose to hire a consulting agency to assist with implementation, training, and even running Marketo day-to-day. Hiring a Marketo consultant or implementation partner can be done via the LaunchPoint marketplace or by contacting a provider directly. I provide marketing automation consulting, alignment, and implementation packages as well. Each implementation is unique, however, full implementations costs often begin at $15,000. Consultants usually range from $125 to $250 per hour. Remember to work with consultants you trust, who align well with your culture, and who deliver quality. Contact Josh Hill at Marketing Rockstar Guides for more info. HubSpot is on a mission to replace the world’s annoying, interruptive marketing with marketing that people love. HubSpot software is the most powerful, tightly integrated and comprehensive marketing software available, putting personalized inbound marketing into the hands of any business. It makes difficult, big-data easy to understand. It also helps people understand the many ways they can segment their lists in order to have the right conversation with the right people at the right time. It is mobile responsive out of the box for all pages as well as email marketing. It saves marketers time with automated drip campaigns, workflows, and competitor analysis. The main dashboard should be more customizable to make it easier to look at customer/lead stats. You should be able to add more info about the stages your leads are at or see where the leads are coming from. Hubspot also does not have a members site option and it cannot run e-commerce. Who is Hubspot Best For? 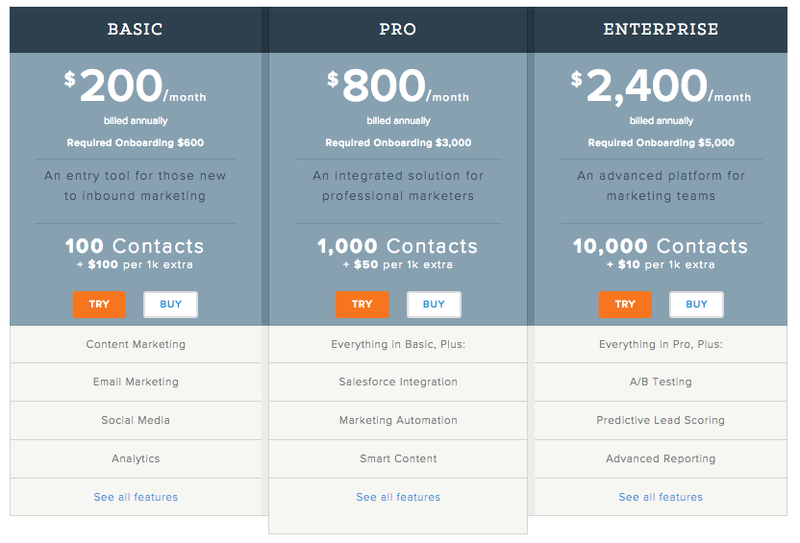 The best fit for Hubspot are small to medium size businesses. They do have an enterprise version for larger clients but most use the professional version. Contact Marcus Sheridan (marcus1@thesaleslion.com) at The Sales Lion to see if Hubspot is right for your business.